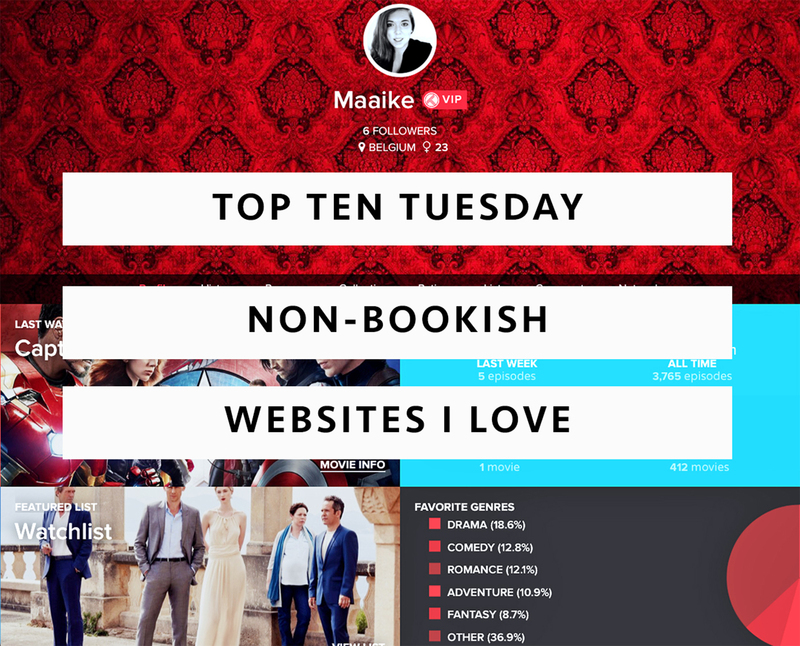 Trakt is a website that tracks (whoaaaaa, no kidding) everything there is to track about tv shows and movies. But it's also a great platform to discover new shows, find out all about dates of season premieres and finales, hiatus, number of seasons/episodes, reviews etc. There are also a lot of statistics. How much time did you waste spend on watching shows this week, this day, overall. What genres do you watch most... There are two types of accounts. Free and premium (VIP). I own a free account and even though there sure are a lot of great features for premium users, this is already more than enough. On the Dashboard page, there is a feature called 'on deck to watch'. 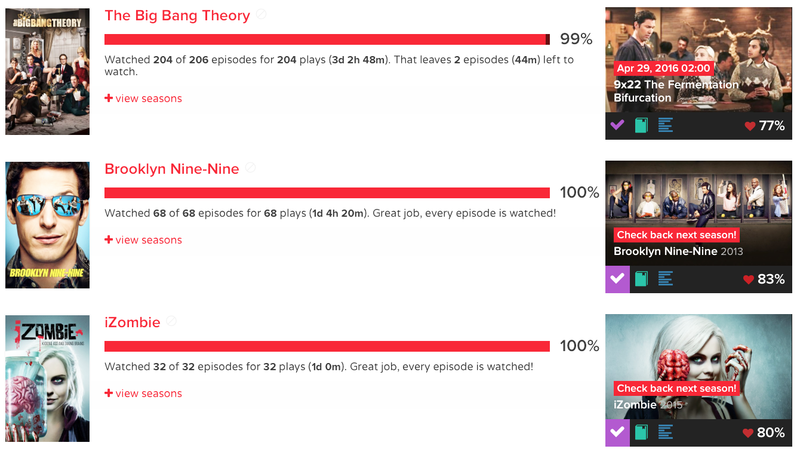 Since the website keeps track of your progress, it shows the six episodes that you "should" watch next. As soon as an episode releases, it will appear there - but if you're not up-to-date, it will show the episode that is the next for you. It also shows the date the episode aired and the title. When you click it, the link sends you to a page that gives you a summary of the episode and everything else you might possibly want to know about it. And on top of it all, it looks really nice! Before Trakt I used to have little pieces of paper flying around, or notes on my computer etc. with a schedule of the shows I watched that were currently running. But as tv shows can not be relied upon to run a straight schedule, I had to adjust it a lot. Mid-season finales, breaks... Sometimes a show starts in the middle of the year. I had to keep checking wikipedia to see if there were new episodes this week and frankly I spent way too much time on keeping track of it all. And now this website does it all for me. On the dashboard page there is a very clean list of every episode (from the shows you watch) that will air in the coming week. Date, hour, network. Everything is there. When there is no new episode, it simply won't appear. When a new season premiers, it will automatically be included. This has saved me a loooot of time. This is another AWESOME feature. You can set up a network. There is a possibility to find and follow friends and acquaintances. And I love that. I love knowing what other people are watching, what they are excited about and if maybe they have discovered something that I should try out! But also quickly finding out if they have seen that anticipated new episode already and if I can safely talk to them without spoiling anything. Or being reassured that no, I do not watch too many shows. Or at least that other people do as well. ;) I don't follow a lot of people. I mainly track my IRL friends/family and I'm slowly trying to convince more and more of them to join the website. Eureka! This may just be the best part of Trakt. I often find myself scrolling through my progress page to see what I have to catch up on, what I have to watch next, how many episodes I'm behind on something and how many shows I'm up-to-date with. I love keeping track of things and this is the BEST THING. Those little red progress bars are my everything, haha. I love seeing them completed and at 100%. It is definitely a great motivation to keep watching something or to catch up soon. Or to see just how fast your rushing through a show. Yes. It's great. You can track your progress on your computer, but it is even easier to do it on your phone. Because there is not always a computer around when you're sitting in front of the tv, and frankly it would be very annoying too. I'd probably never update if that was the case. That's why there is a very great phone application that makes it really easy and fast to update everything. As soon as you have watched an episode, you just click 'watched' and you immediately see the next episode appear. IDEAL FOR BINGEWATCHING! I do hope I have convinced you. If I have, please let me know how to find you - I want to follow you! It takes a little time at first to add all the shows/movies you have watched, but once that's finished everything is very fast and easy. It's a heavenly place for everyone who loves shows and movies and I'm sure you're going to fall in love with it. I sure did.